Why Does My Cat Follow Me to the Bathroom? Purr-plexing Right!? If you have ever wondered why does my cat follow me to the bathroom then stay tuned ahead. Cats are generally independent animals, but they can and do follow you around your home and to your bathroom at some of the most awkward times. While it could be a tad creepy when you first notice this, you should come to notice that this is a way for the cat to communicate to you in some way. Listed ahead are some fundamental aspects that we, at Superwhiskers, feel can help you to better understand why does my cat follow me to the bathroom. 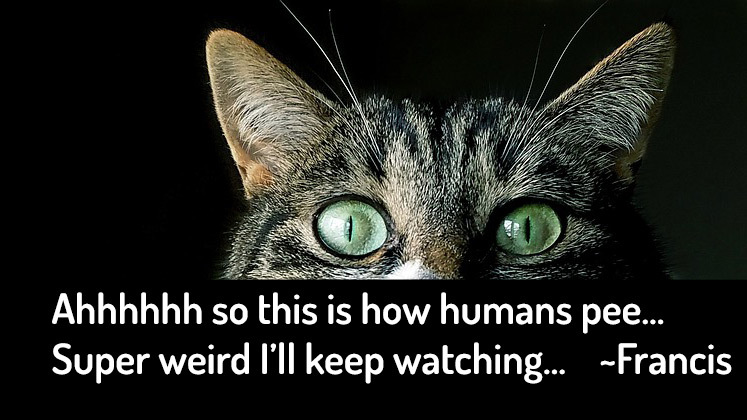 There are a number of reasons why your cat is following you around. After all, the bathroom is not usually a place for play and some cats are bathed in the tub found in the bathroom. I have detailed below some important things that could be attracting your cat to you and what they could mean. So you are sitting on your couch and watching your favorite show on Netflix and you get up for a quick break. Not more than a minute later, your cat appears right at the bathroom door, waiting and following you around. Some may think this is an annoying trait of some cats, but it really is more of them wanting and begging for your attention. Similar to how some children show affection to adults or siblings; cats may follow you around just to get that small dose of attention. If you notice this behavior, consider embracing it as it is a cute way for your cat to communicate that they care and want to interact with you. In the scenario above, you get up and head to the bathroom for a break. If you wonder why does my cat follow me to the bathroom once you get there then consider paying close attention to what your cat could be telling you. Perhaps your cat wants more water, food, or to have a fresh litter change. Who knows, but the reason that they are following you could be a direct communication to you. Take any opportunity that your cat provides as a way to better the relationship between you and your cat. Your cat could be following you to the bathroom to tell you that they ultimately care about you and want to be with you as much as possible. When you leave the room, you know that you will return in a short period, but to your cat it could mean something different. Some animals view your leaving as something that is permanent and when you return it is exciting. The way I see it is your cat wants to make sure they spend every last moment with you as possible. This is a definite sign of affection and it is a great feeling. The reason listed here involves separation anxiety, which is a highly common issue among a number of pets. Separation anxiety is a condition that occurs when you leave and your cat is anxious. Many animals, cats included, get anxious when you leave your home and this can certainly shape behaviors as well. However, when you leave for work each day, your cat more than likely follows you to the door in hopes you return soon. Similarly, if you wonder why does my cat follow me to the bathroom then this could also be a reason why. Separation anxiety tends to go away on its own, but in the even that it does not, there are stress-relieving products that you can utilize to ease their situation each day you leave the home. This last section is more of an odd-ball reason, but with good rationale. Your cat could be following you to the bathroom for all of the reasons listed above, and chances are those are the reasons over this one. However, there is a slight chance that your cat wants a bath. Perhaps your cat is the outlier in the feline world that enjoys soap, water, and brushing and is trying to tell you that it is time for a bath. While it may not be the reason, you have every opportunity to bathe and groom your cat when this happens. Give it a shot and see if this is why they follow you. Cats are often misread, but they are truly remarkable and affectionate creatures when they want to be. If your cat follows you anywhere in your home, bathroom included, then this really could be a sign that your cat loves you, cares for you, and that they want to be around you. In addition, there are some cats that simply have some anxiety the moment you leave, but I try to stray from this as the answer because you would more than likely notice if they were overly anxious when you left. I hope you enjoy today’s discussion on why does my cat follow me to the bathroom, as there are many angles that you can take with this topic. Please consider checking out more of my previously listed cat information on my site.